JKS introduced the HD Tie Rod as a heavy duty replacement for the inferior OE part. Constructed of incredibly strong DOM seamless tubing, the JKS HD Tie Rod is 1.25" in diameter with a 0.375" wall thickness. Each end is correctly threaded to accept the OE tie rod ends for a perfect fit and easy adjustability. 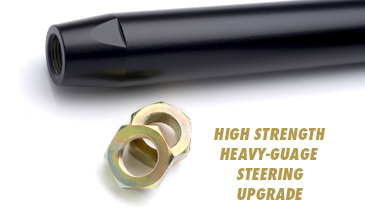 Unlike the OE part, our HD Tie Rod is strong enough to withstand minor impacts on the trail. In addition, the rigid construction provides greater sensitivity to the driver for improved feel and control through the steering wheel. Supplied with right-hand and left-hand jam nuts and powdercoated black.